Beyond India have two locations, North Adelaide and Modbury. You can either eat in, pick up takeaway or have your delicious Indian food delivered straight to your door. The friendly staff are happy to offer their assistance in your selection if you are having trouble deciding. 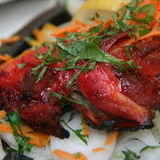 Try the mouthwatering Tandoori Chicken with yoghurt, roasted massala spice and coriander. This is also served with a delicate mint chutney. A must have is the Naan bread, my absolute favourites are the cheddar cheese and the Garlic Naan. Other dishes on offer include Beef Chennai which is an aromatic blend of coconut and and curry leaves, with a touch of spice. Try the Mango Kulfi for dessert as this flavour filled creation comes highly recommended. Kulfi is traditional Indian icecream with subtle hints of spice and is the perfect way to finish off a delicious meal.